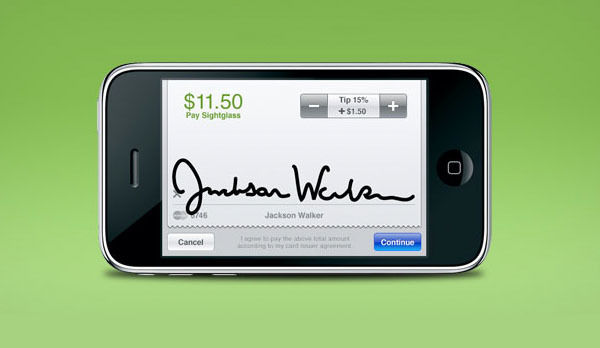 Square or SquareUp is a new secure mobile payment application for iPhone. All you require to take credit card payment is a 3.5mm audio input socket and some sort of internet connection. By connecting a small card reader plug into the audio input anyone can accept immediate and secure credit or debit card payment. Once the card is swiped the customer signs the screen of the iPhone with their finger and enters an email address for the receipt to be sent to completing the almost effortless transaction. The application has undergone vigorous testing at Self Edge in New York and Sightglass Coffee Co. and Flower Cart in San Francisco allowing the Square team to work out the kinks to make it market ready. Square is the brainchild of Jim McKelvey who had the idea back in February of this year after he wasn't able to sell a piece of his glass are because he was unable to accept credit card as payment. The payment system will be releasing in early 2010.